Welcome back for a new year! I'd like to thank all of you for stopping by, leaving comments, and following the blog. I greatly appreciate and look forward to your feedback. I'm looking forward to this year's articles. I've got a good feeling about them and I am really excited about getting nuts for raiding forces in the Sahara! I've got so much planned its unreal. Any way, lets get back to the Compagnie de Tirailleurs Seneglais. 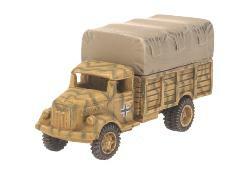 The Matford looks pretty close to the old raiding truck standby: the German Opel-Blitz 3-ton truck. 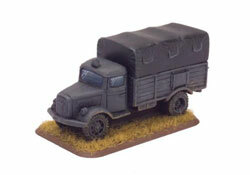 For my French trucks I have gathered some Opel Blitz trucks from a few sources in the Flames Of War miniature line. The first is Graebner's Reinforced trucks (GE439 Reinforced Trucks). These are ideal for raiding trucks given their open bed and the fact that they are one-piece to match with my other raiding forces. Plus, they come with some great stowage pieces too. The second source is the Opel-Blitz kit-set blister (GE430 Opel Blitz 3, 6-36S) which are ideal for modelling a cut-down Matford. The Reinforced trucks pack is great for modelling your Matfords, if only for their open truck beds. They come with some interesting stowage too and will make for some excellent modelling additions. I discarded the pieces with sandbags, as they would not have been used in the trucks, owing to the added fuel consumption and unnecessary weight (might as well just bring the bags as there will be plenty of sand all around them!). Other than that these bad boys don't need any other attention other than a quick wash and a base coat as I have done here, using the Soviet Armour spray can (SP02). The French, Italians, and British found that windshields tended to crack or shatter within a few miles of crossing over the rough and rocky terrain, so it was simply easier just to remove the cab or knock out the glass. These cut-down versions are simple to modify by clipping off the windscreen supports, and sawing off the back end of the cab with a bone/modelling saw. The drivers that come with the blister are perfectly fine as-is, or you can do what I have done by dropping in a British driver, or doing a head swap. The one thing you might want to do is base the truck so that it matches with the rest of your platoon's trucks (assuming you have a mix, like I do). 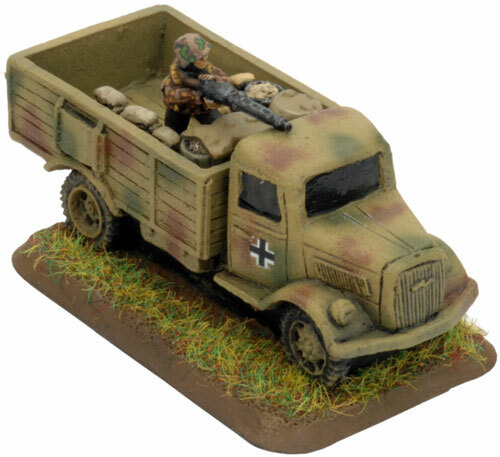 You can also use the all-resin Opel Blitz trucks if you don't want to model a lot of passengers or stowage. These models are perfectly acceptable if you want a cheap and fast way to motorize your Tirailleurs. Adding stowage is where you add character to your trucks. The nature of crossing the Sahara requires a lot of extra gear for "unsticking" your trucks, extra water rations, and fuel (not to mention weapons and ammunition). For my trucks I raided my pile of stowage that I've had sitting around. Its funny just how much seemingly useless bits become useful stuff for your raiding trucks! I also made heavy use of the Desert Raiding Equipment (XSO103) pack from the Flames Of War special order catalog, which comes with a lot of the same stuff in the Reinforced Trucks pack, but also includes things like sand channels, fuel cans, etc. Obviously there are a few things there that won't be terribly useful, such as German helmets and Sherman track links, but I'm sure you'll find a home for those elsewhere! French passengers are a bit difficult to come by. They haven't made it to the special order catalog just yet. But if you're luck, like I was to know someone putting together a Chasseurs Portés Platoon using the FR201 Lorraine 38L Armoured Carriers, you might be able to sweet talk you way into scoring some passangers. Alternatively you can do some head swaps with German or American passengers from the special order cataloge. Another excellent source of French crew is the FRX01 Self-Propelled 47mm Anti-Tank Platoon. But, you may not even want passengers, and there are a few easy ways of getting around them. The first is to use the all resin Opel Blitz trucks as their passengers are safely under the trucks' canvas covers. THe alternative is to just load the truck bed with supplies! This idea came to me when I was working on my Italian AS37 platoon. Once again the Opel Blitz provides an excellent substitution for the FIAT 634N truck that the Autosahariana used so much. But I wanted to make sure that I could get the most of them across several armies. After Kufra fell to the French, they inherited several Fiat 634s and put them straight into service. So I wanted to make sure that the passengers and truck loads were modular so I could swap out the trucks contents on demand and not have to paint a billion Opel Blitz trucks! So I went to my local hobby shop and picked up some textured plastic card. Next I cut small sections that fit into the back of the truck bed of a Reinforced truck. One thing to note here is that because of the nature of the moulding process, and presumably to strengthen the model, the truck bed's walls are not at a 90-degree angle from the floor of the bed. This means you cannot take the measurements for the card pieces off the opening of the bed, but rather do it from the floor itself. Once I had a pile of little insert pieces, I glued a bunch of stowage, benches, and more to them, making sure that they don't hang over the edges of the card. In the case of the Italian trucks I glued a 20mm Breda to the truck bed. With the glue dried, I hit the pieces with some British Armour (Desert) spray undercoat (SP07), and away I went! One other cool thing to use as a modular insert is the canvas covers from the Opel Blitz kit-set blister (GE430). I painted up a set of these to use here and there as well to make the trucks generic enough for any nation to use. For the basecoat, as I mentioned earlier, I used the Soviet Armour spray (SP02). That choice was simply born of convenience as that was the only green spray can I had kicking around. Since the trucks will be olive green, I didn't worry about this too much. Its just a primer really. For my trucks I have chosen to paint all of my Matfords Olive Green, but only some in camouflage. For the basecoat I used Olive Grey (VP888). For the camo, I used Tan Yellow (VP912). After these colors and the truck's details were painted, I gave the whole thing a dry bush of Iraqi Sand (VP819) to give the truck a really dusty feel. As with the infantry component, I went with a simple four-stage drybrush process. The basecoat is Khaki Grey (VP880), followed by heavy dry brush of Green Ochre (VP914), then a medium dry brush of Buff (VP976), finished off with a light dry brush in select places of Pale Sand (VP837). An alternative for Pale Sand is Ivory (VP918). Finally, the base edging is done in Green Ochre. The stones are small bits of kitty litter, and the vegetation are very small patches of Woodland Scenics bushes and scrub (Olive Green). And that's pretty much it! I hope you have found this article useful! I've got two Tiralleurs platoons done, and two more to go. But I might take a break from the French and look to another force in the next article. Seeing this makes me want to cry. When are you going to visit the US Office? Now I want to bust out my French. Great looking models as usual. Thanks for the article. The Tiralleurs platoons do look great. Great work! Love the truck conversion and the use of the beds. I´m following your work step by step to build my own force, thought I´m thinking to use a few Brit figs in shorts to mix within the force. I dont now if you will post later, but my concern its what arty model to use for the force. Any thoughts? I've just finished my artillery battery, so I'll get that posted up soon for you! THe 1.7cm GeBK15 gun should be available very soon. Its the same model used by Leclerc at Kufra, but the French named it the 75mm mle 1928 gun. I managed to score a couple of guns from work so I'll post them up soon. Hope to finished the company in a couple of weeks to use them in a MiDWar tournement in March to be held here in Portugal. My only criticism is that the reflections in the windows, while nicely executed, are a bit bright. It kind of looks like the windows are TV screens broadcasting a sunny mountain range. I won't go into a rant about how reflections like that aren't very realistic as I can appreciate the aesthetic of it. I just think it needs to be toned down a bit. Cant wait for your next update. Keep it up! Nice tutorial and beautiful minis. The idea of removable crew on deck is great. I will have to give it a try. Fantastic work! I really like the way you've kitted out each vehicle for some variety. Fantastic looking force. Great background research and details. I like how you have described the entire process and your thoughts. Your finished product is clever and highly detailed.